Amazon is introducing multi-room music streaming. 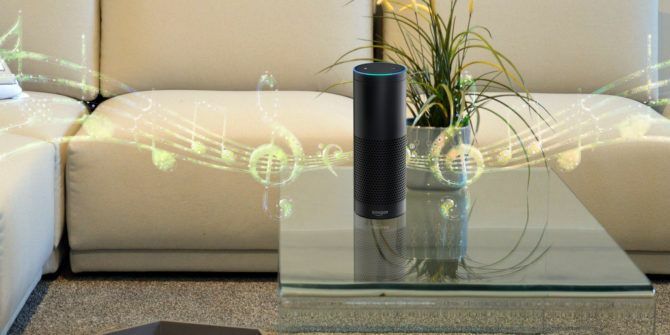 This means you can now stream music to multiple Echo speakers positioned in different rooms of your house. This is great news for those who host raucous house parties, but bad news for your neighbors. And my neighbors too for that matter. The Amazon Echo can do lots of different things, powering other smart devices, for example. However, for most of us, it’s a powerful speaker capable of playing music All the Ways to Play Music Using Your Amazon Echo and Alexa All the Ways to Play Music Using Your Amazon Echo and Alexa The Amazon Echo excels at playing your music. Here are all the ways to listen to music using your Amazon Echo and Alexa. Read More . And now, if you own more than one Echo device, you can synchronize them to stream music all through your house. Amazon’s latest trick lets you group your Echo devices together. All you need is at least two Echo devices (including the Echo, the Echo Dot, or the Echo Show). You can then group them together in whatever combination you see fit and synchronize music playback across them all. Using the Alexa app you can create a group containing two or more Echo devices. And once you have assigned a name to that group (such as “Downstairs” or perhaps “Brian”) you can ask Alexa to play music on that group of devices by simply saying, “Alexa, play Mumford and Sons Downstairs”. This feature initially works on Echo devices in the U.S. the UK, and Germany. And you can play music from Amazon Music, TuneIn, iHeartRadio, and Pandora. However, Amazon is promising support for other connected speakers, other countries, and Spotify and SiriusXM is coming soon. This multi-room feature has a number of different uses. If you were hosting a house party How to Get Any Party Started Using Spotify How to Get Any Party Started Using Spotify Whether you're hosting a calm hangout session with some of your closest friends or organizing a crazy all-nighter with whoever the hell shows up, Spotify can help get any party started. Read More you could have different styles of music playing in different rooms. Or if you’re doing your housework, and busy scuttling between rooms, this means you’ll never have to pause playback ever again. Do you own multiple Amazon Echo devices? Or are you looking to buy more in the future? Do you welcome the opportunity to stream music all over your house? Under what circumstances can you see yourself using this feature? Please let us know in the comments below! Explore more about: Amazon, Amazon Echo, Speakers, Streaming Music. I just successfully created a group consisting of one Dot driving external speakers using a cable, and one Dot that Bluetooths to another set of speakers. I can't get the setup to work; the bluetoothed speakers don't play and the associated Dot becomes the speaker. Does the group function use Bluetooth in some way that precludes connecting to speakers? Does the group function require a family plan?